Hey guys! It’s Sunday and you know what that means—I’m sharing my meal prep combo for the week! That’s 2-3 Budget Bytes recipes that I’ve combined to create four pre-pack meals to eat over the next few days. 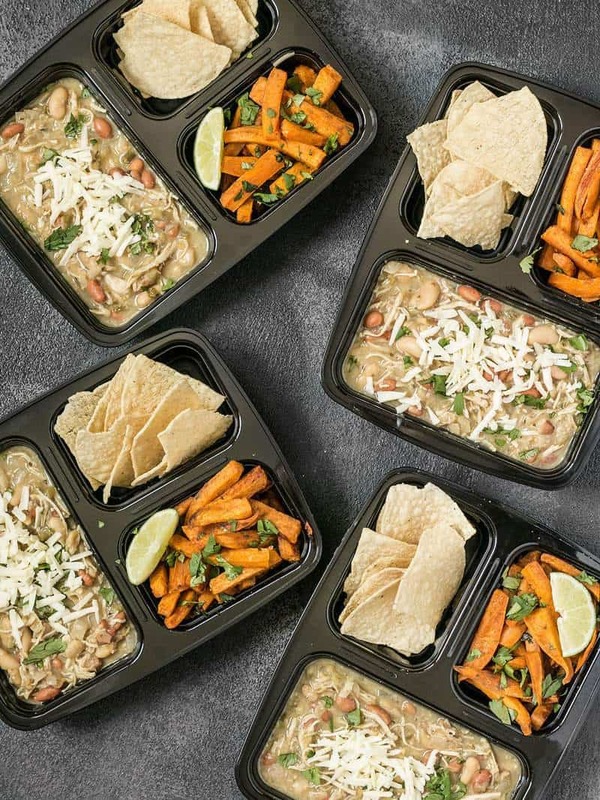 This week’s White Chicken Chili Meal Prep is based on my Slow Cooker White Chicken Chili recipe, which I then paired with some Cumin Lime Roasted Sweet Potatoes and a handful of tortilla chips. I just looove scooping up that chili on tortilla chips, especially with the melted cheese on top! If you’re not into cumin or cilantro, you can swap my Chili Roasted Sweet Potatoes for the Cumin Lime Roasted Sweet Potatoes. Either one goes great with the chili. *I actually have no idea how much the tortilla chips cost, so that is just an estimate. My boyfriend bought the bag and I stole some for the meal prep. 🤣 Plus, tortilla chips are so impossible to quantify for serving sizes. The original recipe for the Slow Cooker White Chicken Chili lists four servings of 1.5 cups each, but I feel like this batch was much larger than that. If you end up having more than four servings of the chili, it freezes great! If you’re worried about the texture of the sweet potatoes after reheating, just know that they’re not really crispy to begin with, so they don’t lose any texture integrity with reheating. I used half the lime to squeeze over the sweet potatoes when they came out of the oven and the other half I cut into wedges and placed one in each box. I will take the lime out before reheating and squeeze the juice over top just before eating. Love the meal prep posts! 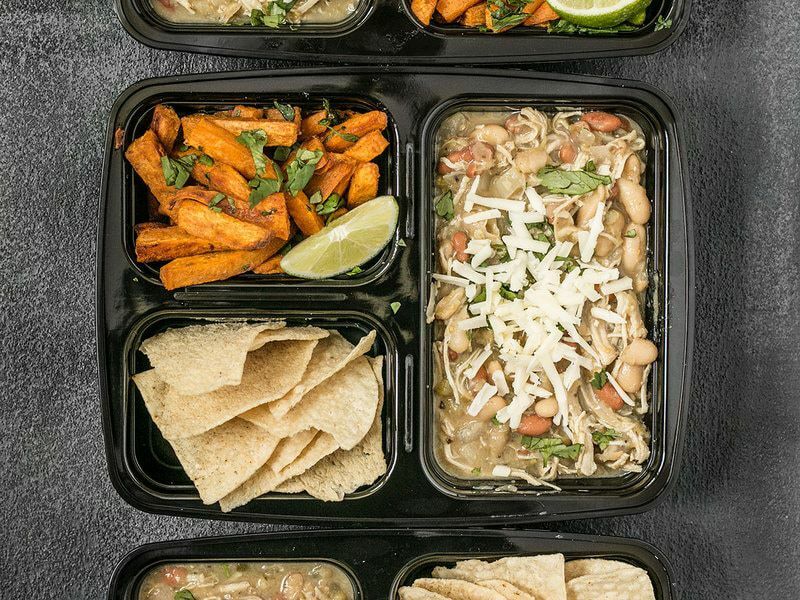 What are the glass containers you use for meal prep? I’m trying to move away from plastic. Thank you! Thank you for the meal prep idea! We ended up eating so many of the sweet potatoes that I only had enough for three meals. Perfect meal combo. I hope to do more in the coming weeks! Thanks Beth! Made this last night and have just had it for lunch- such a great combo! I made the sweet potatoes while the chili was simmering (did it on the hob) and everything was ready at the same time. 10/10 would recommend. UK readers- Waitrose stocks a green salsa if you’re having issues finding one. About how much time do you spend on Sunday prepping (from start to finish, including dishes)? I want to try this but I’m worried about how much time it takes up in my day. Or do you think it saves you time overall? I think that will vary quite a bit from person to person and meal to meal. I’m pretty quick at chopping and am comfortable with multi-tasking, so this particular one took me about an hour and a half with cleaning up. For me the advantage of having these meals in the fridge is more about reducing the temptation to eat out or snack on random things in place of having a real meal, than it is about saving time. I would like to make this without animal products since we have been eating only plant based for over a year for health reasons. Do you have any suggestions? I did used to love white chicken chili and it seems almost impossible to make it without the chicken. 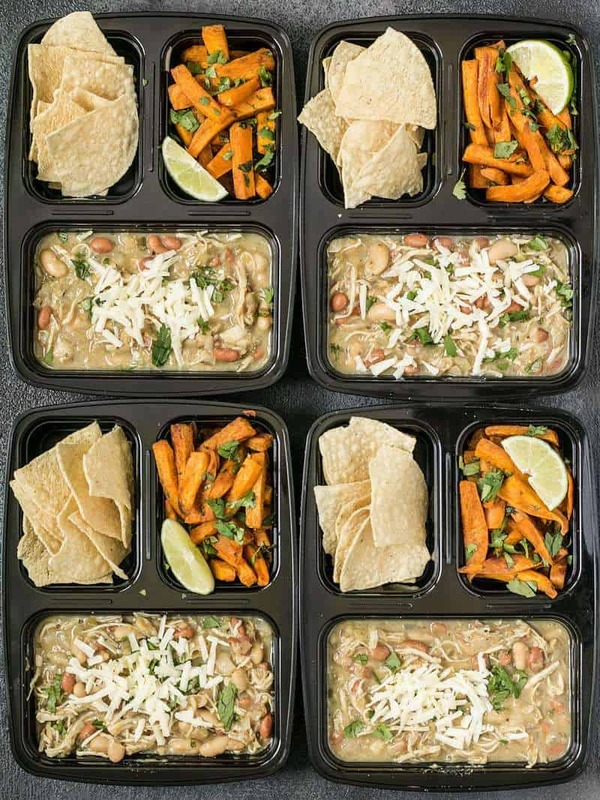 I’m also a vegetarian and when I saw this week’s meal prep, I wondered how to make vegetarian white chili as well and found this: https://www.vegetarianventures.com/creamy-vegetarian-white-chili/. I haven’t tried it yet, but I plan to! I love your meal preps! I’ve prepared two of them so far and look forward to many more combos you come up with. Omg it looks great! I will definitely have to make that one. This looks like a great prep meal! I just keep them in the fridge for four days. :) If you have extra chili besides what went into your four meals, you can freeze that for some other time.